Here is where you share your fundraising ideas for fetes and fairs and discover what other people people have been getting up to. 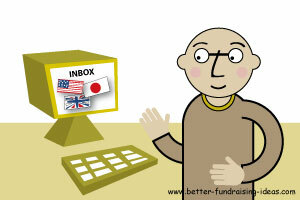 This site is used by fundraising groups all around the world. So if you have discovered one of those great little fete fundraising ideas or just want to share a tip with other people please send it in. We are also always particularly interested in the ways you have made a tried and tested idea even better. This information can really help other people. We love to hear your stories and award cash prizes to any ideas we think are really good. If you have pictures so much the better you can send those as well. To send in your ideas is really simple. Do you know any great fundraising ideas for fetes and fairs? Or did you put on a special fundraising event that was a real winner? Try to include as much information as possible it is often all the little details that are the most useful to other fundraisers. Tip: You may like to type out your idea first in a text editor and then cut and paste into this box. Click below to see the great fundraising ideas submitted by other people. Fete ideas - It's a cracker! !